For me, and my kids, the thought of having a laptop stolen while at school or an event is a very real one. My girls are in college, my oldest son just got his first laptop and I have mine for blogging and events I go to. The last thing any of us wants is for it to be stolen! None of us has the money to replace something like this. 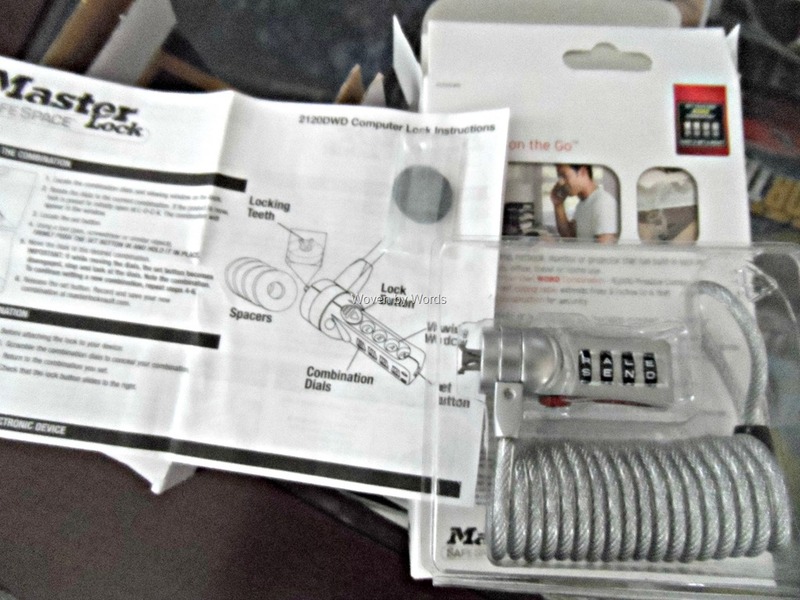 Now, the kids and I have used Master Lock for years. I grew up using them in high school, then my kids went to middle school and needed two each year. High school was the same and then when my girls went off to college, they needed them mostly for their bikes. We didn’t have a way to keep their laptops safe when they first started. Heck, until I was offered to review the 2120 SafeSpace Laptop Lock, I didn’t even KNOW there was such a thing. I also didn’t even realize the little hole towards the back of my computer was actually for that specific thing! Since Buddy just got his first laptop (a very cheap laptop) I figured this would be extremely helpful going into his first year of high school. We don’t know the area at all and I have no idea what the atmosphere is like there. Even in the nicest of situations, you never know who might get a case of sticky fingers. Unfortunately, I couldn’t get the lock to work in his laptop. The lock comes with 4 pads that you can add to reduce the gap between the lock and laptop, but that wasn't even the problem. The issue was the computer. The spot where the teeth would grab inside the laptop was too big. It just kept slipping out. Of course, my first thought was that there was a a problem with the lock itself. I tested that thought out on my laptop. I worked the first, second and third time and without the bumpers. I went back to Buddy’s laptop thinking I may have done it wrong, but no, I still couldn’t get it to lock. So, it looks like I have a new lock for when I need it. I think it’ll be great for travel and for any blogging conferences I might go to. The other thing I need to do is ask my daughters how safe they feel their laptops are at school. Baby started a new college last year, and I haven’t ever asked her about how safe electronics are there. I guess I just assumed it was just fine. So, how does this little gadget work? So easy it’s crazy! You push in the set button on the back, change the password to the one you want, slide the red lock button back to make sure it moves and away you go! When you pull the lock button back, the teeth that secure it into the side of the laptop smooth down and you can slide it into the slot. 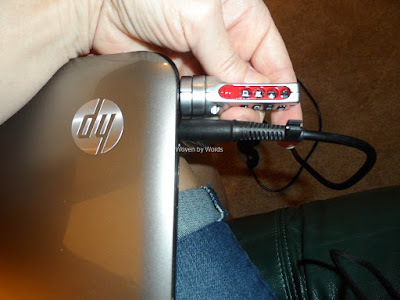 Once you let go of the lock button, the teeth open back up and you’re laptop is secure. 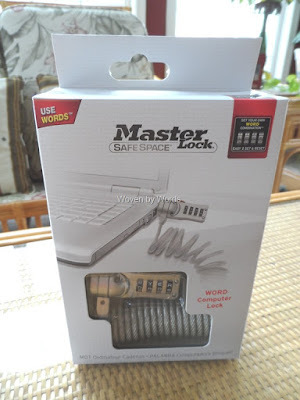 Master Lock is holding a “Master Campus Challenge” on the brand’s Facebook Page or www.MasterCampusChallenge.com for a chance to win gift cards, the latest electronics, Master Lock products and other teen must-haves! Now you have the chance to win a SafeSpace Laptop Lock from Master Lock. *I received the lock for review purposes. The opinions expressed are my own. What an amazing invention. Who would have thought of a lock for your computer. SO smart. I would love to get a document storage chest. The one we have is too small for all the documents and other important valuables we need to store in one. We could use the Shrouded Padlocks for our gates on the property! 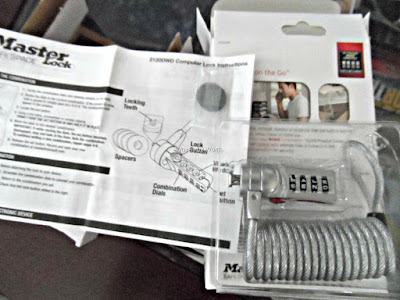 I would be happy to have the Personal Lockout Kit for our rental property. Thanks! I need a fireproof vault or a smaller document locked box. I never thought about a lock for your laptop , haha?